Dreaming of a Royal Retirement? Printers401K, an AICC Money Saving Program, shares an article on retirement plan options. With the upcoming Royal wedding due to take place on May 19th, 2018, it has many people dreaming of what it would like to be royalty. While this might not be in the cards for most, a royal retirement could be closer than you think. Cash flow is like the water in the moat surrounding a successful retirement. It ís an essential element of financial planning that can help you defend your castle against unexpected expenses, coffer-raiding or overspending. Cash flow planning combines five interdependent activities: setting goals, establishing an emergency fund, calculating your net worth, recording expenses and communicating your wishes to your loved ones — the five elements of cash flow planning. It’s impossible to plan without having a goal in mind. When it comes to your future finances, start with the basics, whether it’s to pay down school loans or to establish a three-month emergency fund. For example, if you were faced with a $500 unexpected bill, would you be able to cover it? Nearly six in 10 Americans don’t have enough savings to pay a $500 or $1,000 expense, according to Bankrate. Without having a cash cushion, emergencies can cause you to tap funds earmarked for other purposes, such as your retirement. An emergency fund not only can help you manage a car or home repair, it can tide you over in the event of an unforeseen illness or job loss. Your ability to project your future income needs depends on the clarity of your financial picture today. Your best snapshot for that is your net worth — the total value of what you own minus what you owe. 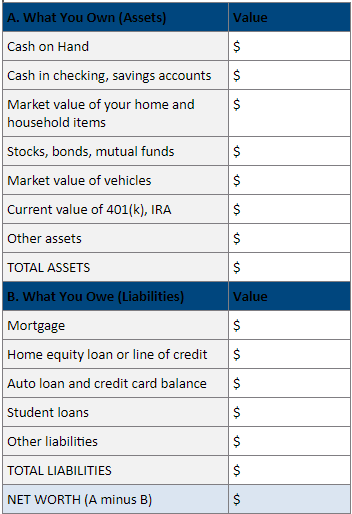 Here’s a simplified worksheet to give you a rough approximation of your personal or household net worth. Many people who struggle with not knowing where their money went don’t have a firm handle on their expenses. If this fits your description, consider buying a small notebook and recording what you spend every day. Add it up at the end of the month. You may be surprised to see where all your cash is going! Spouses or significant others often disagree about the role of money in the household. One may see cash as a license to shop and spend, the other for saving. The important thing is to communicate these views and resolve disagreements well before financial stress enters the picture. Cash flow planning is at the core of financial planning, because cash flow can give you the freedom and flexibility to rule your destiny. That’s a worthy goal any king or queen can champion.